The Snaps and Constraints allow you to control how you draw and move objects. Using the different settings will allow you to draw straight lines and rotate objects evenly. Left clicking on the check box will activate each of the controls. You may choose an Angle Snap setting by clicking on the radio button. Midpoint: This will snap to the midpoint of any line or arc in your scene as you draw. 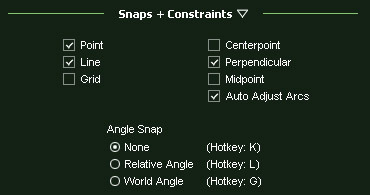 None: This option will turn off angle snapping, which affects drawing shapes or rotating objects and shapes in your project. Relative Angle: With this option, as you draw a shape, lines and arcs will snap 45 degrees relative to the previous line or arc drawn. 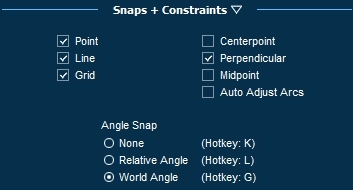 World Angle: With this option, as you draw a shape or rotate an object, it will snap to every 45 degrees globally.